Nightmare in Berlin is the fifth book I’ve read by the German author Hans Fallada, (1893-1947) but it was when I read the first one that I wondered if Fallada had any optimism about the future of post-war Germany. This is what I wrote at the conclusion of my review of Alone in Berlin, (1947) Fallada’s story about the futile resistance campaign of a working-class couple against the Nazis, a couple who believe that once you’ve seen that a cause is right, you’re obliged to fight for it. Is there redemption? Writing so soon after the war, Fallada must have yearned for a new Germany, and the Quangels are a metaphor for parents of the next generation. The ‘baptism’ of the street-thug Kuno, his rejection of his unrepentant father and his adoption by the symbolically named Eva is a clear indication of Fellada’s hopes for a humane post-Nazi Germany. 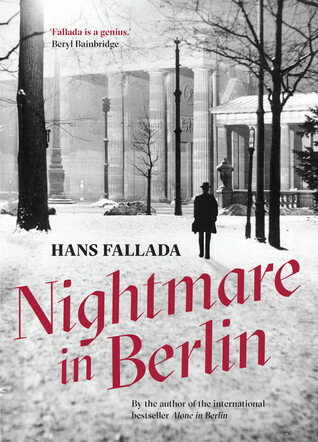 Nightmare in Berlin is the novel that Fallada had to write before he could write the more hopeful Alone in Berlin. It’s about the time between the evil regime and the establishment of a new order, and how an ordinary man felt about his country’s past when he could not see what its future might be. A thinly disguised autobiographical novel which traces the life of Doctor Doll in the immediate aftermath of Germany’s defeat, it represents not only the chaos of its downfall, but also the soul of a man trying to come to terms with the moral quagmire of German responsibility for its monstrous crimes against humanity. An author with a substance abuse problem like Fallada himself, the character of Dr Doll is a flawed human being. He never actively supported the Nazis but he never did anything to oppose them either. He did not resist as Otto and Anna do in Alone in Berlin; and he feels an overwhelming sense of shame and apathy because there is nothing now that he can do to make reparation. He feels the torment of collective guilt and an inescapable sense of the hatred that the world feels for his country. Losing a war today doesn’t mean what it did in the middle of the twentieth century. As we see today in the Middle East and Afghanistan, a ‘victory’ can be pyrrhic and doesn’t necessarily bring peace. But in 1945 Germany and Japan were both subjected to Occupations which acted as social reconstruction forces in demoralised nations guilty of horrendous war crimes. Dr Doll and his younger wife Alma, unlike the Nazis hastily hiding their uniforms, are ready to welcome the Red Army into their town in north-east Germany ; they are pleased that the decision has been taken not to resist the advance. But they are taken aback to realise that their liberators despise them, as does the rest of the world. Morally adrift, Dr Doll is placed in an invidious position when the Reds designate him as Mayor and he is given the power to exact justice on the black marketeers, on the Nazis who withheld supplies that sustained their lavish lifestyle when others were starving and also on a personal enemy. But despite working fourteen hour days, Doll soon finds that he can’t put things right for people who suffered, and he and Alma decide to set off for Berlin, where they hope their apartment is still in one piece after the bombardment. Things are even more chaotic in Berlin. The city is largely reduced to rubble, and what’s left of their apartment has been assigned to a brassy young woman, occupied by their opportunistic caretaker and ransacked by the neighbours. There is literally nowhere for them to sleep, and Alma’s craving for morphine is reactivated when she seeks medical help for her infected leg. Before long both Doll and his wife are escaping homelessness, hunger and cold through their addiction; they drift into an apathy which costs them dearly because they fail to follow procedures for getting ration cards and housing, and they recklessly waste what money they have on the luxury of American cigarettes. Both of them end up in separate hospitals, where Doll finally realises that it is other Berliners who are rebuilding the city by hand while he and Alma are idling in self-indulgent self-pity. The novel sounds grim, and in places it certainly is, but Alma is a bright and lively character whose escapades made me chuckle. With the Red Army on the doorstep she gives cheek to the departing SS as she would never have dared to before; and when the tanks arrive she weaves in and out amongst them on her bicycle as if their procession is almost playful, as if they were having fun. Her caprices are irresponsible, but her courage inspires Dr Doll, and her faith in his ability to write his way out of their misery is what eventually leads to a resolution of sorts. Life goes on, and they would outlive these times, those who had been spared by the grace of God, the survivors. Life goes on, always, even beneath the ruins. The ruins are of no account; what counts is life – the life in a blade of grass in the middle of the city, in amongst a thousand lumps of shattered masonry. Life goes on, always. Doll, at any rate, was determined to be part of this learning process. He saw his path laid out before him, the next steps he had to take, and they meant work, work and more work. Beyond these first steps, the darkness began again, the darkness that obscures the future for every German today; but he preferred not to think about that. In the last few years, people had learned so well how to live in the moment, from one day to the next: why should that lesson not be put to good use today? Just get on with life and do your job: that should be his watchword now. Nightmare in Berlin is a reminder that just an evil regime can arise if good men do nothing, a barbaric State can transform itself through the power of those who wish for something better. Review copy courtesy of Scribe Publications. Available from Fishpond: Nightmare in Berlin; direct from Scribe Australia and Scribe UK or good bookstores everywhere. Great review Lisa. I tried to read Alone in Berlin but struggled with the style – maybe this one would suit better! Hi. I’ve just finished Alone in Berlin and am not sure I want to tackle this one if you describe Alone as more hopeful, I was not left hopeful at all but quite despairing of how thoroughly a destructive autocratic regime can entrench itself and how impossible it would be to remove. I suppose it depends how you look at it. I think there’s something hopeful about the spirit of humanity when two ordinary people persist with their resistance even when they know they’re in peril of their lives and even when they think it won’t have any effect. I have Alone in Berlin to read but now I’m not sure if it’s a good idea to start there or read Nightmare in Berlin first? I would read Alone in Berlin first. I think it’s his best work. It’s interesting that Doll and presumably the author discover that the Germans are despised. I grew up with WWII literature, but none I think from the pov of German civilians. I think we very soon distinguished between Nazis and Germans and surprisingly quickly resumed normal relations with the latter. Ditto with the Japanese. Yes, it’s quite a vivid scene. Doll and Alma go out to welcome the Soviet Army and the Reds look through them as if they’re not even there. I suspect it might be a bit easier for Australians to resume normal relations with Germany because Australia was a long way away from warfare against civilians in their major cities. It’s a bit harder to do when you’re still subject to rationing even in the 1950s and there’s a massive housing crisis. And while there might be high profile examples of people forgiving the Japanese, I also know some POWs who are quietly nursing resentment that trade imperatives obliterated their right to an apology and compensation. I’m sure it is easier for Australians, and I’m sure those who suffered were slower to forgive their former enemies than those who benefitted from an early resumption of trade. Perhaps when I retire I had better start reading more widely. *chuckle* I’m finding I can’t really read much more than I used to, my eyes get too tired if I read all day now, like I used to in school holidays. But it wasn’t a book that me realise that the situation of the POWs is much more complex than we think, it was the diary of a POW who lives next door to a friend, a lovely, gentle old man now in his nineties. What is really sad is that he’s felt the pressure to forgive all his life, and now he’s feeling guilty that he can’t do it. I haven’t heard of Fallada but I’m intrigued – this book sounds excellent. Hi Kate, I had never heard of him either until Scribe first brought out English translations of his work, but now I would say that he is a must-read German author. I’d missed this review as anything mentioning Fallada would certainly have piqued my interest – this has only just been published here and in June I had no idea it was even being translated! The ending of Nightmare is certainly optimistic, though I did wonder how much faith to place in it given that the novel is a roller-coaster of Doll’s moods. Well, yes, good point, and then there’s the substance abuse as well. Maybe I should have written ‘moments of optimism’. I’m reading Doctor Faustus by Thomas Mann at the moment (which I probably won’t finish for the 1947 Club week because it’s so long) and it’s making me realise just how awful if must have been for people of good intent at that time. There’s a bit where he ponders his own feelings about whether his country wins or loses the war. He’s appalled that they might lose – because who wants their country to lose a war? but he desperately wants the regime to end, he has been sick at heart about it and powerless for so long. Defeat is the only way to make change happen but even then he’s not sure about how to rid the canker out of the German soul. But this would not be something you could talk about with anyone, no consoling chat at the pub about these existential issues, you’d have to keep it to yourself. I imagine that losing a loved one in a war would be unendurable, but it would be made even worse if your country lost the war and you found that your loved one died fighting for a cause that the entire world despises. It seems to me that ambivalence about the future would have been widespread, and that it would seesaw between bouts of optimism, counterbalanced by pessimism about the postwar reality.